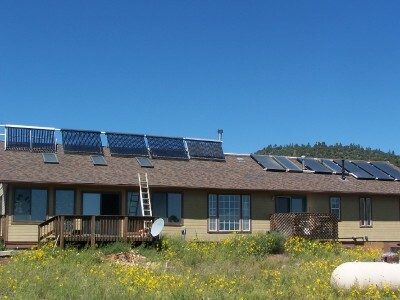 This system was our first solar installation (on the owner's house) and much was learned! It is over-engineered with some design elements we no longer use. And yet, in a testament to the robustness of solar thermal, it works fine! We created this system from used flat panels sold/given to us. The panels were made in the 1970s and 1980s. There is no measurable loss in panel performance. The evacuated tube panels are scratch-and-dents from our own installations (actually the scratches and dents come from those he-men at FedEx Ground). Panels collapsing your roof is virtually impossible - the weight of the panels is about 4 pounds per square foot - no house built with at least 2X6 roof rafters or 2X4 roof trusses will have an issue, although, depending on the span, problems are theoretically possible. The vast majority of buildings in America can support the load of solar panels, be they PV or solar thermal. But convincing your local code authority is another matter. Note this link will trigger a scary security warning from your browser. It is OK to proceed to the site.